The parade during California Indian Days in Covelo. 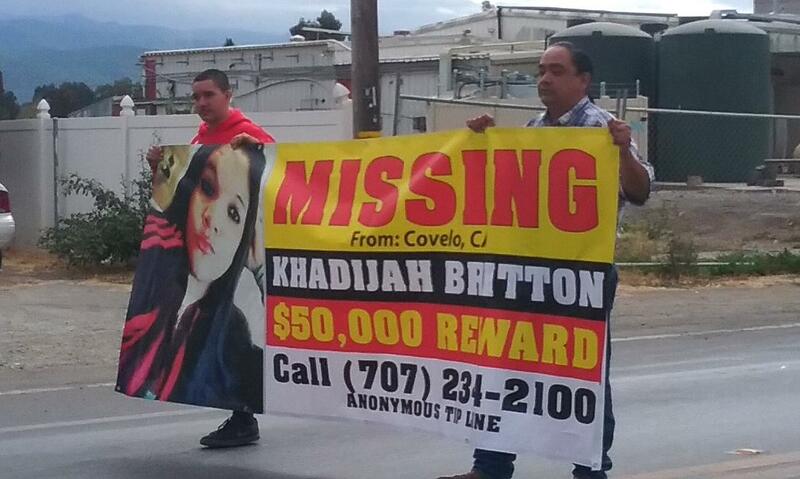 MENDOCINO Co., 10/2/18 — Khadijah Britton has been missing from Covelo since February 7, but her family, friends, and community members have not ceased searching for her, encouraging people with information to come forward, or calling for justice. A scene from the California Indian Days in Covelo. Lindon Duke leads a riderless horse representing the absence of Khadijah Britton. Britton's father is at the right of the photo in red. Parade participants ask for justice. Britton's mother is in the silver truck which is being driven by her grandfather Ronnie Hostler. Her grandmother Lydia Hostler is also in the truck. On September 29, relatives and supporters of Britton joined in the California Indian Days parade in Covelo. A riderless horse was led through the parade route in Britton's honor, symbolizing her absence, and family and friends carried banners and signs decorated with photographs of Britton, calling for people to break the silence around her disappearance. The primary suspect in her disappearance, Negie Fallis, is also from Covelo. He has not been charged in connection with her disappearance, but is currently facing related charges of being a felon in possession of a firearm, and will next appear in court on October 5. Britton and Fallis were previously romantically involved, and Fallis is alleged to have beaten and threatened her shortly prior to her disappearance. Britton's family members have highlighted the importance of addressing domestic violence during her disappearance, as well as noted that Britton is one of many missing or murdered indigenous women throughout North America. During the parade, as they have with many court appearances, vigils, and community fundraisers, Britton's friends and family wore red sweatshirts decorated with her likeness, as well as pins and yellow ribbons with the words "Hope," "Justice for Khadijah," and "MMIW," which stands for movement to address the disproportionate numbers of Missing and Murdered Indigenous Women. "Last year you played in the tournament with your family. This year the Softball field was shut down during the parade so your family could attend the parade. A horse was led through in your honor to signify the missing rider. Dance groups who have never met you danced and prayed for your return and comfort to your friends and family. We love you Khadijah Rose." The Mendocino County Sheriffs Office continues to seek any information related to Britton’s disappearance, and her family is offering a $50,000 reward for any information that helps find her. Anyone with information about Britton should contact the MCSO tip line at (707) 463- 4086 or the tip line (707) 234-2100. You can read The Mendocino Voice’s complete coverage of Britton’s disappearance and Fallis' legal proceedings here.